One of our supporters sent us a copy of a magazine ad that appeared in an English football magazine circa 1978! We did some homework and it appears the Institute of Motorcycling was a face of what is now today’s Motorcycle Industry Association in the UK. It is surprisingly fresh and relevant; even the mention of the advancements in two-wheel technology is spot on and speaks a lot to what Motorcycles OK is all about. There are a lot of people who don’t need to be sold the benefits of two wheels. They know and accept all the advantages of economy, size, convenience, ease of parking, speed, maintenance, maneuverability and freedom. For all this they are put off by two things. Our climate and the fact that on two wheels you’re vulnerable. The contraption above solves both these problems. But it isn’t a motorbike. It’s a two-wheeled car, providing little of the exhilaration which is the very essence of motorcycling. So can the problems be overcome another way? Most riders would say yes. Firstly, modern weatherproof clothing is completely ‘weatherproof’. So much so, that many businessmen riders step straight from their protective suits, pinstriped, into the office. Secondly, two-wheel technology has advanced considerably in the last few years. Machines handle better and stop more quickly – if they’re ridden properly. And the training schemes run by the RAC/ACU and Two Wheels Teach-In offer everyone the chance to get proper tuition. Indeed, many people, including some police constabularies, believe that in the right hands, two wheels can be safer than a car. 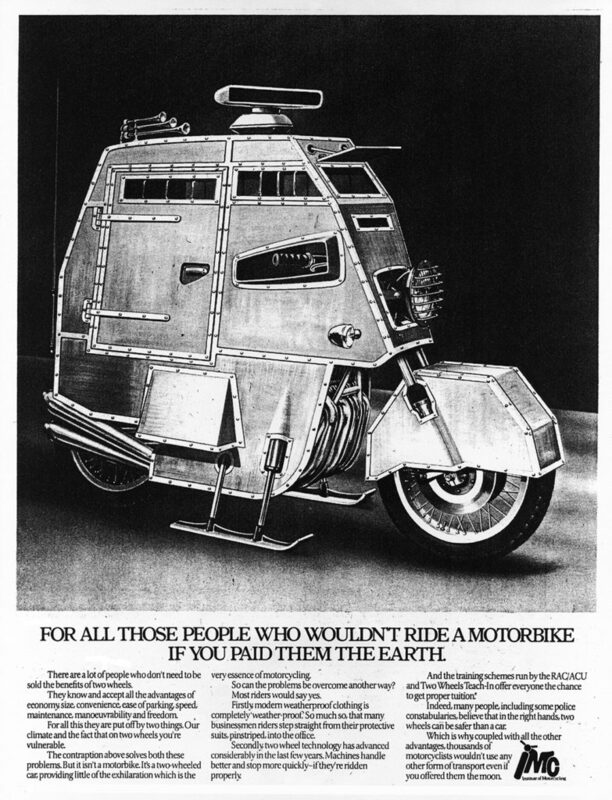 Which is why, coupled with all the other advantages, thousands of motorcyclists wouldn’t use any other form of transport even if you offered them the moon.